Vortigern the Very Thin (or more properly Gwrtheyrn Gwrtheneu) appears to have been the son of a certain Gwidol, probably a man of some importance from the Gloucester area if his supposed ancestry it to be believed. However, the lands of Vortigern's sons indicate that, while his power-base eventually stretched across Gwent, Powys, Buellt and Gwrtheyrnion (in north-west Radnorshire), the latter area, being named after him, may show his original homeland. According to the inscription on the famous 'Pillar of Eliseg', Vortigern married a daughter of the Emperor Magnus Maximus named Severa and it was probably this imperial link which enabled him to take control of Britain as some kind of high-king, probably around AD 425. The unreliable Geoffrey of Monmouth first tells the story, but we have no way of knowing whether there is any truth in it. When the High-King Constantine was murdered by Pictish assassins, Vortigern urged that the late king's eldest son, Constans, be raised to the throne, despite the fact that he was a monk. Vortigern became the young boy's chief advisor, but this was not enough for him and he soon plotted Constans' death. Vortigern then seized the Crown, while Constans' younger brothers, Aurelius Ambrosius (the historical Ambrosius Aurelianus) and Uther fled to Brittany. However, Vortigern had not chosen a good time to take on the governance of Britain, for, as the earlier Nennius, put it, "during his rule in Britain he was under pressure, from fear of the Picts and the Irish ... and, not least, from dread of Ambrosius." The latter did not return until 437 when he fought a man named Guidolin (alias Vitalinus) at the Battle of Wallop. He was probably a relative of Vortigern whose grandfather bore the same name. Ambrosius was victorious and was "given all the kingdoms of the western side of Britain" to keep him quiet. The raids from the Picts over Hadrian's Wall and the Irish on the west coast grew in frequency throughout Vortigern's reign. Surprisingly, Nennius did not mention the still more famous Germanic peoples raiding the east and south coast. However, he does add details of subsequent events, based on Bede and, ultimately, Gildas (who however only refers to the 'Superbus Tyrannus' not Vortigern). By around 440, the organised defence of the nation had more or less completely collapsed. Vortigern, however, came up with a cunning plan to thwart the invaders. He decided to set a thief to catch a thief by employing a Jutish and/or Anglian element of the Germanic enemy as mercenaries in particular to repel the Picts and their fellow Northern Europeans. In return, they were given land. According to Geoffrey, this was in Lincolnshire around Caer-Correi (Caistor). While employing such foederati was a well used Roman practice, it was one which was to go horribly wrong for Vortigern and gain him a reputation as the man who handed Britain to the Anglo-Saxons on a plate. In 447 St. Germanus of Auxerre visited Britain for a second time, accompanied by Bishop Severus of Trier. His motives appear to have been both religious and secular. Nennius tells how a holyman called Germanus encountered Irish pirates in both Powys and Cheshire and also visited the Royal court of King Vortigern. This may have been at Caer-Guricon (Wroxeter in Shropshire), in the middle of Vortigern's power-base, where the 'palace' of a rich and powerful 5th century lord has been excavated. Germanus accused Vortigern of fathering a child by his own daughter. Such a story may have been invented to further blacken Vortigern's name, while the Germanus in question may have the Breton St. Garmon who was active in adjoining North Wales rather than the Bishop of Auxerre. Duplication of dates makes the exact path of events difficult to disentangle. However, it may be that further foreign invasions obliged Vortigern to once more to ask for Anglo-Jutish help around 451. The exiled Jutish leaders, Hengest and Horsa, and their men arrived in Ceint (Kent) and were welcomed by the King of Britain. He agreed to clothe and house them in return for their mercenary services. Eventually, however, Vortigern was unable to uphold his side of the bargain, so the Jutes sent for reinforcements to prevent their expulsion. Plying Vortigern with drink, they persuaded him to hand over the Kingdom of Ceint (Kent) to them in return for the hand of Hengest's beautiful young daughter, Rhonwen. At the same time, her brother, Octha, was sent north to settle the region and hold back the Picts. Despite the initial success of Vortigern's foederatus employment policy, the secession of Ceint (Kent) was not a popular move, especially with its former king. In 455, Vortigern's sons, Vortimer and Cadeyrn, rebelled against him. They raised an army and fought Hengest at the disastrous Battle of Derguentid (Crayford) after which Hengest's men chased the British army back to London. Vortimer was subsequently poisoned by his step-mother. The following year, the less decisive Battle of Rithergabail (Aylesford) appears to have been a British victory, though Cadeyrn was unfortunately killed in the fighting. Eventually a peace conference was called at Amesbury Abbey (or nearby Stonehenge) in Wiltshire; but the Anglo-Jutes unexpectedly pulled knives from their shoes and massacred the whole British contingent save for Vortigern himself. The king was ransomed in return for control of Essex, Middlesex and Sussex. This event was to become known as the 'Night of the Long Knives'. Vortigern fled to the extremities of Wales where he decided to build himself an impregnable stronghold on the southern slopes of Yr Aran, above Beddgelert (Gwynedd). However, after construction began, it was found that, each night, the previous day's work was destroyed by unknown forces. Vortigern consulted the druids, who suggested he look for a young fatherless boy, born of the fairies, whose sacrifice would placate the gods and allow for the fortress to be finished. Vortigern's men searched throughout Britain until just such a boy was discovered, most commonly it is said in Caer-Fyrddin (Carmarthen). The boy, called Myrddin Emrys, shortened to 'Merlin', laughed at the druids and explained that the building works collapsed because they were shaken by the battling of two fierce dragons buried beneath the mountain. 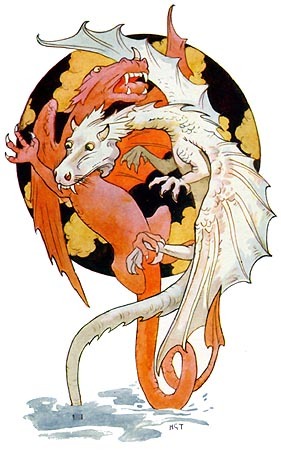 The white dragon, representing the Anglo-Saxons, was defeating the red Welsh dragon, thus prophesying their eventual conquest of the majority of Britain. With the dragons removed, the fortress was completed, but Ambrosius Aurelianus seems to have have become the centre of resistance against both the Anglo-Saxons and Vortigern at this time, and he ousted Vortigern from his new home. He fled once more, but the site in which he took refuge is much disputed. It may have been to the Roman station at Old Carlisle (in Cumberland) or to an unknown fort in Gwrtheyrnion. The most popular traditions, however, indicate either the old hillfort of Little Doward, above Ganerew in Ergyng, or the hillfort of Tre'r Ceiri in Yr Eifl (the Rivals) on the Lleyn Peninsula. Wherever it was, Vortigern's stronghold was miraculously struck by lightning and burnt to the ground, with Vortigern inside. He is sometimes said to have been buried in Nant Gwrtheyrn, also on Lleyn. This was around AD 459. � Nash Ford Publishing 2007. All Rights Reserved.